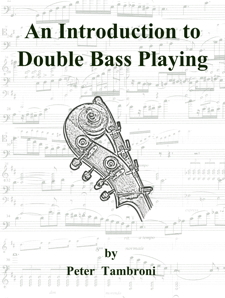 I recommend tuning the bass with harmonics. This is more accurate and easier to hear than using open strings. I try to get bassists to tune this way as soon as possible. Listen to the reference pitch! Then play the ‘A’ harmonic on the D string. This located in IVth (fourth, using the Simandl numbering system) position which should be at or near the crook of the neck. Lightly touch the string (do not press it down as playing a regular or stopped note) and bow the string. I like to use my first finger but you can also use your fourth to skip a step later on. A harmonic should sound (a light bell or chime like sound) one octave higher than a stopped A at the same spot. Tune the D string (using this A) to the reference pitch, A. **NOTE** If you are sharp and lower the string you will need to give the string a slight pull as sometimes the ‘slack’ of the string gets taken up in the pegbox and not over the entire string. This applies to all strings. At this point we should have an in tune D string. Now, place your 4th (pinky) finger on that same harmonic – IVth position D string. Put your first finger on the A string. Your entire hand should now be in IIIrd position. Play (bow) your fourth finger note, which should be an A harmonic on the D string. Then bow the A string (your first finger is on the note D), again lightly touching the string to produce a harmonic. The two notes should be the same, if not adjust the A string to the first pitch (which is now the reference pitch). After you have tuned the A string, move your hand over one string. You will still be in third position but now your fourth finger will be on the A string and you first finger will be on the E string. Go through the same procedure. Each finger should be producing an E harmonic, be sure to use your fourth finger as your reference pitch! Once the E string is in tune we only have one more string – G, but as you may notice its in the ‘opposite’ direction. Place your first finger on the D string, in third position. It will be where the note G is, but again your going to lightly touch the string to produce a harmonic. Play your first finger harmonic, which should a D, listen to it then play your fourth finger note. Remember that now, your first finger is the reference pitch! So your going to adjust the G string to the D string. I recommend going through this process again because now the tension over the entire bass may have changed enough to cause the first tuned strings to go flat!